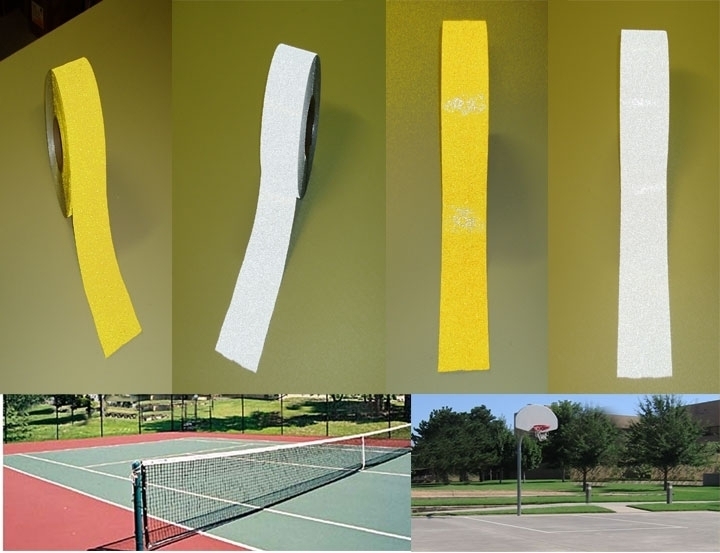 Yellow or White Pavement, Court and Floor Marking Tape. Alumimum based construction for conformability. Standard and premium grade. Easy to apply. Apply to clean dry and fairly smooth surface and then press in with a heavy bouncy rubber tire. The rougher the surface the more pressure that should be used. When properly applied the tape will seal with the surface forming a water tight bond. Can be applied using our floor tape applicator. Available in yellow and white in our standard or premium grade. Self adhesive, conformable, aluminum based product. Semi permanent or temporary applications. Compatible with our floor tape applicator. Standard Grade is mildly reflective. Premium Grade is thicker and much more reflective. Consists of an alumimum film coated with adhesive on the bottom and coated with paint and reflective glass beads on the top. Our tape is simple to install with no special equipment or contractor required. If the tape gets damaged it just takes a few minutes to replace the damaged piece. It is about as thick as normal traffic or floor paint and has a durable, reflective surface. 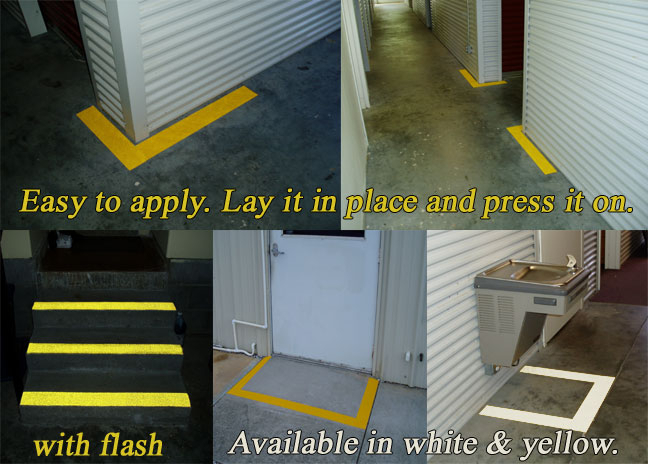 The tape's aggressive adhesive and conformable foil backing insure that when properly applied your white or yellow lines will remain in place. It can be removed if necessary. Longevity depends on wear level and proper installation. The tape performs best on smooth surfaces where all of the tape can make contact with the surface. The tape must be pressed onto the surface well for it to perform properly. A rubber tired dolly with weight on it is often sufficient. An automobile tire is best. Multiple passes with a heavy tire may be neccessary. 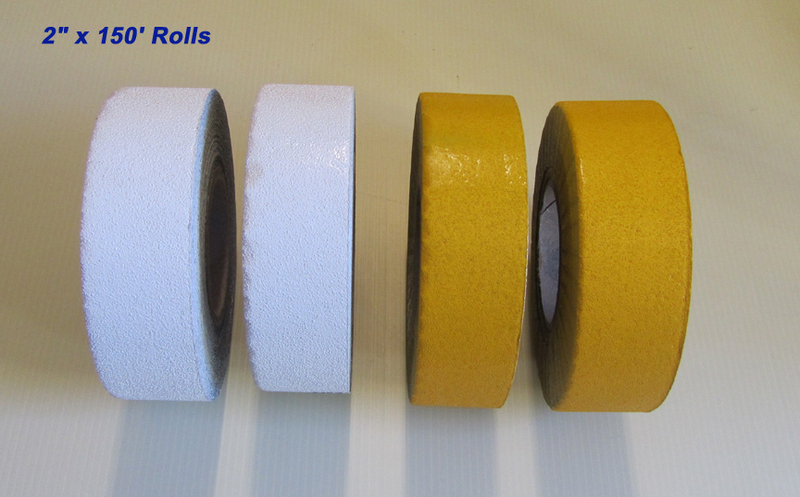 For large projects we suggest you install a roll of the tape first to determine if it will meet your requirements. Sand, dirt, oil, curing paint or sealcoat will prevent this product from adhering properly. It is always recommended that you test a small piece of the tape on your surface before applying larger amounts. Click here to see our installation pictures. INSTRUCTIONS - To install our pavement/floor striping tape simply apply it to a clean, dry surface and press it on so that it completely conforms to the surface. The temperature should be in excess of 50 degrees. Dry, clean, sun warmed asphalt or cement is ideal. 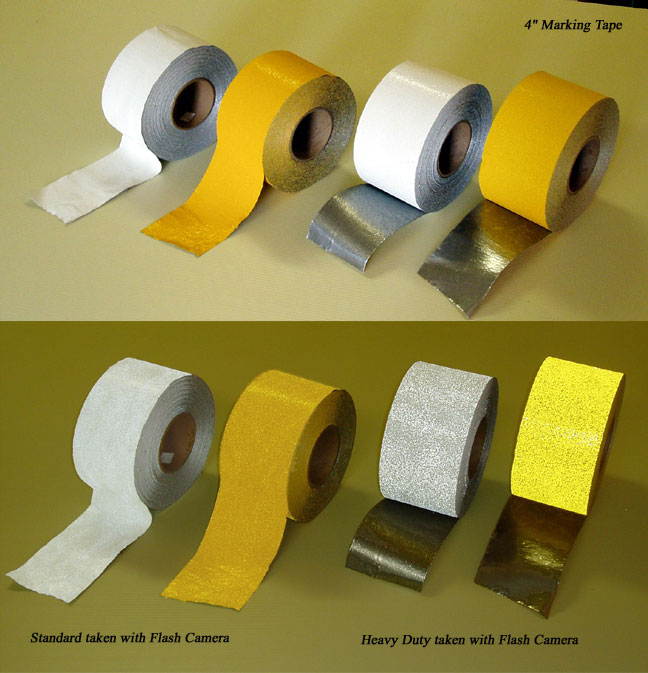 The tape performs best on smooth surfaces where all of the tape can make contact with the surface. The tape must be pressed onto the surface well for it to perform properly. A rubber tired dolly with weight on it is often sufficient. An automobile tire is best. Multiple passes with a heavy tire may be neccessary to force the tape to conform to the surface. When using a vehicle be careful not to turn the steering wheel while on the fresh tape. Also, avoid applying the tape to damp asphalt or cement. Also, it is best to apply when it has not rained in 48 hours. After application the tape is ready for use, however, full curing occurs after about 48 hours and it is best if it does not rain during this time as well. I recommend you apply the tape and press it in very well. Then after 24 - 48 hours press it in again. It is also recommended that you test a couple of pieces on the surface you are going to mark and leave them down for a day or so.